Diablo 3 first released last May for PC and Mac, scoring highly among reviews (we gave it a 9/10); but for me, I always thought it would have been better on console. When I think of co-op, I think of my buddies and me huddled around a single TV, working together and calling out enemies as we see them. So when it was announced that Diablo 3 would be arriving on console, my heart leapt with joy. FINALLY. Upon starting up Diablo 3 for the first time on console, the visuals and sound were instantly better than my experiences on PC. While I’m sure there are those out there who have PC setups that would top my entertainment system, I believe a lot more people will benefit from consoles when it comes to visuals and audio since the systems are easier to upgrade. Diablo 3 for the console is exactly like Diablo 3 for the computer when it comes to story, you play as a barbarian, demon hunter, monk, witch doctor, or wizard; each having their own skills, abilities, and weapon/armor loot possibilities. It has been 20 years since we last defeated the Prime Evils and while in the town of Tristram where it all began, a star has fallen, an omen that the end of time has begun. It is your duty to investigate the fallen star and once again rid the lands of pure evil. Since we’re no longer using a keyboard and mouse, the game’s mechanisms have been redone to support a controller. One of the most notable is that unlike the PC version where you click your mouse to move and attack, controls are now used with the standard left joystick for movement. Since Diablo is already an overhead game, it’s incredibly easy to control with a single stick. The right stick is reserved for rolling or evading, and the controller buttons are almost entirely for skills. It is notable that there isn’t the exact control with the controller that you’d get with a keyboard and mouse, but for this type of game it’s nice to step back and just play without having to remember so many hotkeys. Red downward triangles? NO THANK YOU! Aside from movement controls being changed, the menu system has also been redone for the console since we don’t have all those keyboard navigation keys. Upon activating your menu with the Back button, you’ll be presented with your Inventory, and can switch to Skills, Party, Quests, and Lore with the controller bumpers. The inventory has been replaced by a wheel, so just aim your left stick at the body slot you’d like to alter, and the controller face buttons will allow you to equip, examine, or drop that item. The wheel will also be used in other aspects of the menu, like the Skill tree where you highlight which spell you’d like to change. Speaking of items, the console version makes it a bit easier to compare your precious loot. The items still have their same attributes, Life Damage and Protection, but instead of having differences displayed a percentage, the console version instead uses a simple +/- system so you can quickly compare. Should you want to compare in more depth, just tap on the X button and the full item attributes will be displayed. Be prepared for intense monster infested co-op battles. Like the computer version, Diablo 3 on Xbox 360 supports multiplayer action both locally and on Xbox LIVE. Each supports up to four players in your party, and you can mix and match between local and online co-op partners as long as everyone’s an Xbox LIVE member. The reason this game is so great when it comes to co-op is because the game is extremely aware with what’s going on. 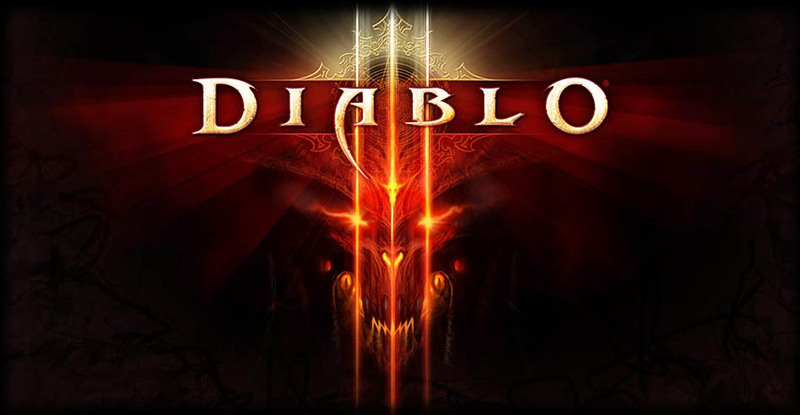 Most co-op games require everyone to be moving in sync with each other, but Diablo will notice when certain players have put their controller down, and will take over. The game won’t take over and battle hordes of enemies for you, but lets say your group is moving to a new area and you need to run to the fridge for a drink, the game will notice you’re not interacting with the controller and your character will follow the group automatically. If you’re more for the solo side of things and have only blood lust in your eyes, the game also supports brawling. Brawling is a free-for-all mode that pits you in an arena with 2-3 other players and everyone fights to the death. One aspect that did not transfer over to the console is Diablo 3‘s Auction house. For those unaware, the Auction house was a way where you could take the loot you’ve found, and sell it for either in-game gold or real-world currency. Sadly the system was a huge failure, and former Diablo 3 game director Jay Wilson even went on to say in March that he felt the feature “really hurt” the game. Luckily for us, the feature is void from the console version. Diablo 3 is hands-down one of the best co-op games on the Xbox 360. Even if you're planning on crawling the dungeons solo, there should be no hesitation on this purchase, it is everything Diablo is supposed to be, finally in reputable console form. The only thing downside is that such a great game was released so late on this console generation's life, and so long after the computer version.